Humans have a need to quantify things. And sometimes the usual measurements — feet, meters, grams — are not good enough. Or funny enough. Sometimes you need to express things in bananas, Helens, or cows. There are almost as many different ways to measure things as there are people — even once you eliminate ones that had the same name but were extremely variable. Beyond the garn and the beard-second, here are ten units meant to make things easier that don't really seem to actually help. How do you express, to an everage person, radiation exposure? Bananas. The Banana Equivalent Dose (BED) is .1 microsievert, roughly the equivalent of the dose you'd get from the naturally occurring radioactive isotopes in a single banana. Another way to think about it as that one banana equals 1% of your average radiation exposure. You could double how much radiation you're exposed to in a day by eating 100 bananas (100 BED). Do not do that. If Helen of Troy was the "face to launch a thousand ships," then the Helen is the amount of beauty required to do so. A millihelen is both a beauty and style blog, and the exact amount of beauty required to launch just one ancient Greek ship. If you're wondering about the relative power of the other Helen derivatives, David Goines has got you covered. For farmers, the literal size of a field was much less important than its utility in sustaining cattle. Ireland once used "a cow's grass" as a unit of measurement — that is, the amount of land needed for one cow. In America, the "mother cow index" determined how many pregnant cows an acre of land could support. As opposed to size, it was a quality measurement. Like the foot or the carat, the barleycorn was named for — and initially meant to equal — the size of an actual thing. In this case, a corn of barley. 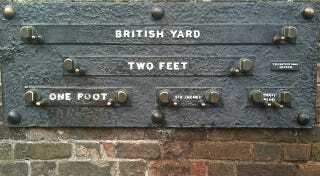 It was standardized to 1/3 of an inch and is still in use as the basis for shoe sizes in Great Britain and Ireland. One barleycorn is the difference between each size. One quarter of a barleycorn is a poppyseed. As Belgium, Wales, France, and Texas are all used as units of land size, the Sydharb (or Sydarb) is a unit of water. Obviously, this is in use in Australia as the name is a portmanteau of Sydney Harbor. The sensitivity of computer mice is measured in mickeys per inch — Mickey Mouse, get it? It's the length of the smallest detectable movement of a mouse — usually between 1/200 and 1/300 of an inch. This unit was named for New York Times columnist Thomas Friedman and describes "the next six months." As in "the next sixth months are critical" or "the next sixth months will be the last." The use of a Friedman Unit is almost always followed by another Friedman Unit. The moniker came about after an article by Fairness and Accuracy in Reporting showed that Friedman used the "the next six months" as determining the outcome of the Iraq War at least fourteen times in a two and half year period. As a tribute, blogger Atrios coined the "Friedman Unit" for "sixth months." The Morgen — Dutch and German for morning — is the area that can be tilled by a single person behind a single oxen "in the morning hours." Hence the name. And, as the name implies, it was used in Germany, the Netherlands, Poland, and Dutch colonies. Depending on your location, the Morgen was equal to anywhere between 2,000 to 12,000 square meters. Presumably, the latter areas had more productive men and oxen. The Morgen was still in use in South Africa until the 1970s and is still in use in Taiwan, where it's called the "kah." Physicist Paul Dirac wasn't the most talkative man in the world. As a result, his colleagues created the Dirac unit — which equaled one word per hour. Because that's the kind of joke scientists love. It's also called "the Dirac unit of shyness." If we have the foot, why not the hand? Using a clenched fist or the breadth of a hand as a unit of measurement goes back to Ancient Egypt. Using the part of the body we most often hold up to things to determine their size makes a ton of sense. King Henry VIII in 1541 tried to standardize the hand to four inches, but the use of fists, handsbreadths, and hands confused the issue. These days, the four-inch hand is still used to measure the height of horses, which is very confusing for laypeople trying to understand how tall a horse is. Especially since horse heights aren't from the hooves to the ears but to the withers — the highest part of a horse's back.